I do all my dev and testing work in a VM running Server 2008 R2. I inevitably run in to problems with the various default security settings for IE9 on this OS. In today’s incident, I was unable to get IE9 to properly render HTML 5 controls on KendoUI’s demo site. This is a problem since I’m working with Test Studio to record a few tests and it uses IE9 for recording. Having a highly secured browser on your production boxes is a Good Thing; however, for your dev or testing systems it’s nothing but pain. Add the sites you’re working with to the Local Intranet or Trusted Sites zone. Tools | Internet Options | Security | Click “Trusted Sites” | Sites | Add. You can use wildcards to add entire domains. Turn off Enhanced Security Configuration. 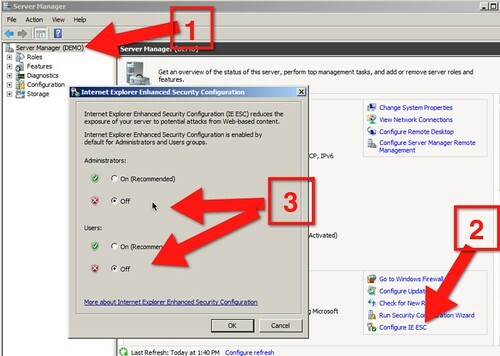 Start Server Manager, click the server, then Configure IE ESC (in the Security Information section). Turn ESC off for both Admin and regular users. WARNING: You should spend a bit of time understanding what the impacts of this are for your dev/test environment, and you should never, ever do this sort of stuff on a production system. UPDATED: Fixed busted picture URL. Whoopsies.